I remember my grandfather telling me about this guy, he told me in several times how good he was. My Dad grew up with Jimmy Mclarin in Canada. They palled around for most of their teen years. 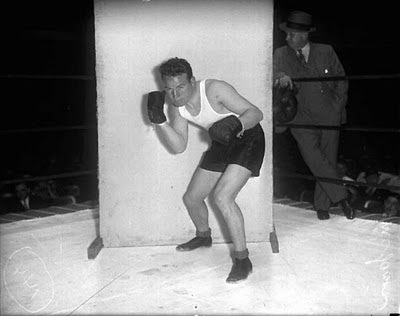 They both boxed for Pop Foster & all came to the US on an early boxing tour. All decided to stay. My Dad, got as far as Denver where he decided to give up boxing & become a basketball player, he was a 6'2", 200 lb'r & went on to play for the old Gates Rubber team in the league that preceded the NBA of today. My Dad settled down in Los Angeles in 1930 & married & raised a family here I was the oldest of 3 & unknown to my Mom my Dad had my name on the Hollywood Hospital birth certificate recorded as "Jimmy" in honer of his old friend. He did not recon with my Moms insistence that I be named Earle Jr. after my Dad. It was changed before we left the Hospital. 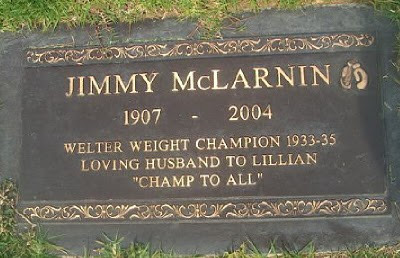 About 18 mounts later my brother Jim was born as as you might guess he was named after McLarin. McLarlin & Foster spent many evenings at our home whenever they were in town. Our family photo album has a number of pictures of all of us & Jimmy hold us as babys.